Iridium Monthly Plans for satellite phones include 10-200 voice minutes of airtime each month, no long-term contracts, free voicemail and call display, free incoming calls and text, optional airtime pooling, and voice and data coverage everywhere on Earth via the Iridium network. 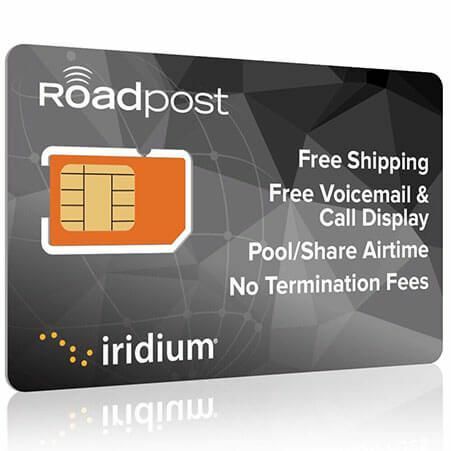 With an Iridium plan from Roadpost you’ll enjoy more value, free features and convenient options like true pay-as-you-go monthly service that you can change or cancel any time. Tip: Check out our Iridium Extreme 9575 and Iridium 9555 sat phones. Perfect for Iridium satellite phone plans. Ideal for anyone that makes more than 34 minutes of calls to other Iridium phone numbers each month. Enjoy unlimited* calls to Iridium numbers for one low price. *Calls to Iridium numbers will not be decremented from the airtime included with your monthly plan. Airtime pooling does not apply to this feature. For the calls that that count, don't count the minutes. The lowest cost mobile-to-mobile rate in the industry — for anyone making more than 34 minutes of calls to Iridium numbers per month. Add this affordable feature to your Roadpost monthly plan and enjoy unlimited* calls to Iridium numbers! Cancellations on month-to-month satellite subscriptions are billed to end of your current monthly bill cycle date. *Note: All rates are per minute, except text messages/SMS which are per message.